Man is the animal who is not satisfied with merely living his life, but who is capable of — and insists upon — watching himself doing it. He not only is, acts, feels, and knows; but unlike any other animal. he is insatiably curious to observe his body, his actions, his feelings, and his thoughts. When he does this, however, he is seldom wholly satisfied with what he finds. Nature, he discovers, has been both niggardly and clumsy in the appearance it bestowed upon him, and likewise in the talents, virtues, and powers with which it equipped him. Therefore, no sooner does he get a good look at himself than he takes steps to effect, as best he can, changes for the better. In Vernor Vinge's short story "Apartness", the Northern Hemisphere has been rendered uninhabitable by a terrible war, nuclear, chemical and biological. Two hundred years later, a scientific exploration fleet from South America sails to Antarctica and finds an isolated tribe who call their land New Transvaal. Much less adapted to the cold, both biologically and technologically, than our Inuit, they turn out to be the descendants of the last white men on Earth: South Africans who escaped from their country after a genocide against all white Africans. When the scientists land, the leader of the tribe greets them. They are surprised by his clothing. Most of the tribe are wearing crude sealskin parkas, but his is particularly impractical, and in fact resembles a double-breasted jacket more than anything designed to keep its wearer warm. Imagine a product that will adds inches to your perceived height, shaves 20 lbs of your midsection, and makes you appear more muscular. And the magic item can do all this instantly! 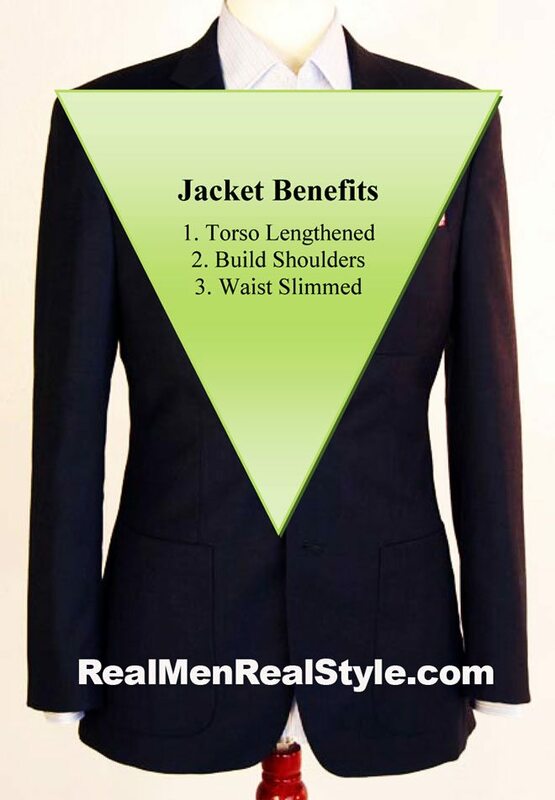 Centeno says that jackets improve their wearer's appearance in three ways: by bulking out the shoulders; by slimming the waist; and by drawing attention to the face and making the wearer seem taller. The first of these benefits, the bulking effect, is obvious. The second, the apparent slimming, happens because jackets taper a bit above the waist, and widen above the taper, an effect accentuated by their outward-spreading lapels. And they flare out over the stomach and hips, hiding weight you may be carrying under the flare. So the middle of the jacket is narrowed, which "makes you look like our image of a healthy man: tucked at the waist, widening above it". As Centeno continues: "Think of it as a tummy tuck without the horrible, invasive surgery." And the third benefit is also because jackets widen towards the top. This makes us naturally look from the waist up rather than the face down, making us think we're looking up at something even when we're taller than the wearer. This keeps people looking at your face rather than your middle. Centeno suggests asking people to guess your height with and without a jacket: the "with" guesses will always be greater. Benefits of wearing a jacket, from Antonio Centeno's article. Moroccan shirt. Owner of photo not known. Moroccan dress or kaftan. Photo marked as by Studio Lorenzo Salemi. So, going back to visual linguistics, one question about these visual "utterances" is: why are they so popular, and what has this to do with the way they enhance the wearer's perceived fitness?